2014 was certainly a year of change for SATVI, with the departure of Professor Willem Hanekom to join the Bill & Melinda Gates Foundation, several longstanding projects reaching successful completion, and two large proof-of-concept efficacy trials starting with a ‘bang’. It has also been an extraordinarily busy year, in which the SATVI clinical and laboratory teams have conducted clinical trials of no less than 7 tuberculosis vaccines and a novel jet injector device, in newborn, infant, adolescent, and adult study populations. It was a pleasure to take on the challenge of leading this dynamic research group, given SATVI’s solid operational, financial, and academic foundation. Highlights for the group include approval as an National Institute of Health (NIH) Division of AIDS Clinical Research Site, formal accreditation as a University of Cape Town Research Centre, and renewal of the SATVI Laboratory SANAS accreditation. New operational systems developed by Chief Operating Officer Zameer Brey and Field Site Manager Marwou De Kock have improved efficiency across the board and renovations to the vaccination clinic will streamline procedures for the teams at the Worcester site. 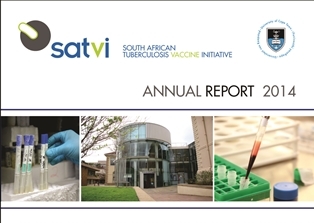 SATVI continued an excellent track record of research outputs, with 24 peer-reviewed publications for the year, with high impact publications including the findings of the RIFAQUIN tuberculosis treatment-shortening trial (Jindani et al), reported in the New England Journal of Medicine. There were many individual achievements, but two deserve special mention — Associate Professor Tom Scriba, Deputy Director Immunology and 2014 recipient of a Silver Medal from the Medical Research Council of South Africa, was awarded a high-profile grant from the MRC Strategic Health Innovation Partnership to study correlates of risk for tuberculosis; and Dr Michele Tameris was awarded her second Wellcome Trust grant, to study community engagement in tuberculosis research through street theatre. We look forward to working with our international partners and stakeholders on several exciting new projects, with live mycobacterial vaccine trials and innovative, experimental medicine studies on the horizon. Finally, a heartfelt ‘thank you’ to all our study participants and their families in the Worcester community who support our clinical trials and share the SATVI vision of ‘a world without TB’.